Sabapathy was one of Tamil cinema’s earliest full length comedies. The film, which was released in 1941 was produced by A.V.Meiyappa Chettiar and directed by A.T.Krishnaswamy. The plot was based on Pammal Sambandha Mudaliar’s play by the same name. This post was first written for The Cinema Resource Centre. Tamil theatre was unarguably the biggest breeding ground for Tamil cinema, whose origin and development encouraged the easy migration and transition of actors, technicians, authors and themes from theatre. It was a relationship which began in the early days of cinema and lasted right upto the 1980s. Some of the most memorable films in our industry have been remakes or adaptations of stage plays. The Tamil theatre background of our greatest actors is well documented. Equally worthy of documentation is the contribution of various playwrights whose subjects were remade as films that were both critically acclaimed and commercially successful. Foremost amongst them in this regard was Pammal Sambandha Mudaliar. Born in 1873, Sambandha Mudaliar authored nearly a hundred works comprising of plays, short stories, books on religion and of course, his extremely informative autobiography. Rightfully known as the father of Tamil theatre as we know it today, ten of his plays were remade as films. Undoubtedly the biggest hits amongst them were Manohara and Sabapathy. This post is about the former. Film historian Randor Guy gives us more details on the film here. This Thursday, the 13th of November marks the 92nd death anniversary of Sankaradas Swamigal, the man who spearheaded the renaissance of Tamil theatre. He passed away on the night of 13th November 1922 in Pondicherry, where he had shifted to during the last few years of his life. Writing in his memoirs Enadhu Nataka Vaazhkai, T.K.Shanmugam says that Swamigal’s last few years were a far cry from the glory days of his remarkable career that spanned more than 3 decades and around 70 works. A stroke had paralyzed and immobilized him, confining him to bed. His death truly marked the end of an era. He was just 55 years old at the time of his death. It is thanks to T.K.Shanmugam that we know something about Sankaradas Swamigal’s life today. In addition to writing about his interactions with him in his memoirs, Shanmugam also wrote a short biography of Swamigal titled “Tamizh Nataka Thalaimai Aasiriyar” which was first published in 1955. In the foreword, Shanmugam writes that amongst his dreams to perpetuate the memory of Swamigal was to construct a memorial for him in Pondicherry. That dream was to translate into reality sometime soon after, when a memorial for Swamigal was constructed in the Karuvadikuppam Cemetery (where his last rites had been performed) in the outskirts of Pondicherry. On a visit to Pondicherry last year for a function, I took some time off to visit the cemetery. The location, just off the ECR was quite easy to find, thanks to its proximity to a famous local Saint’s Samadhi. It was a Saturday afternoon and there was not a soul in sight (literally!!) save a watchman and couple of tipplers who obviously on a high had parked themselves comfortably on the benches. With trees aplenty and silence all around, the place did present a rather ghoulish appearance. I would not have ventured anywhere close to the cemetery had there been work in progress! The watchman showed me the way to the memorial, which lies a bit removed from the cemetery in the mid-left of the sprawling campus. 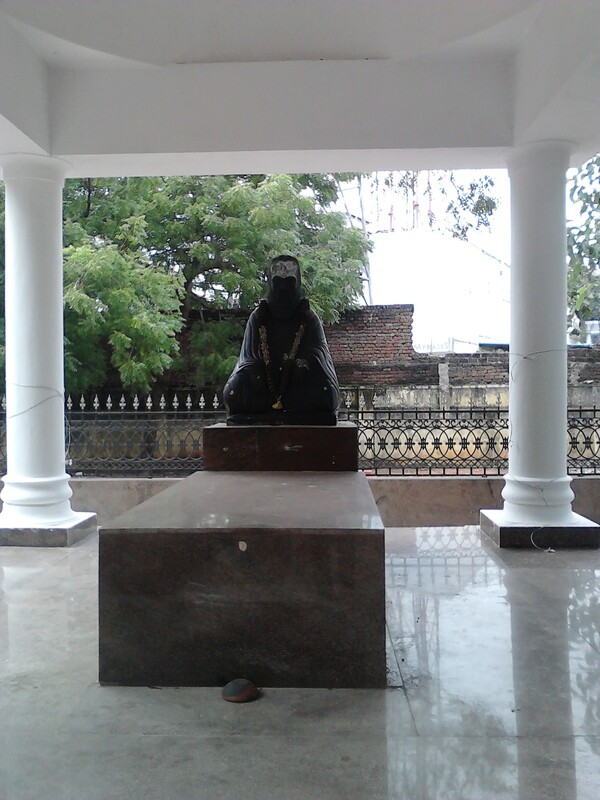 Surprisingly neat and well maintained, the memorial has a statue of Sankaradas Swamigal seated on a slab, with a mandapam surrounding it. 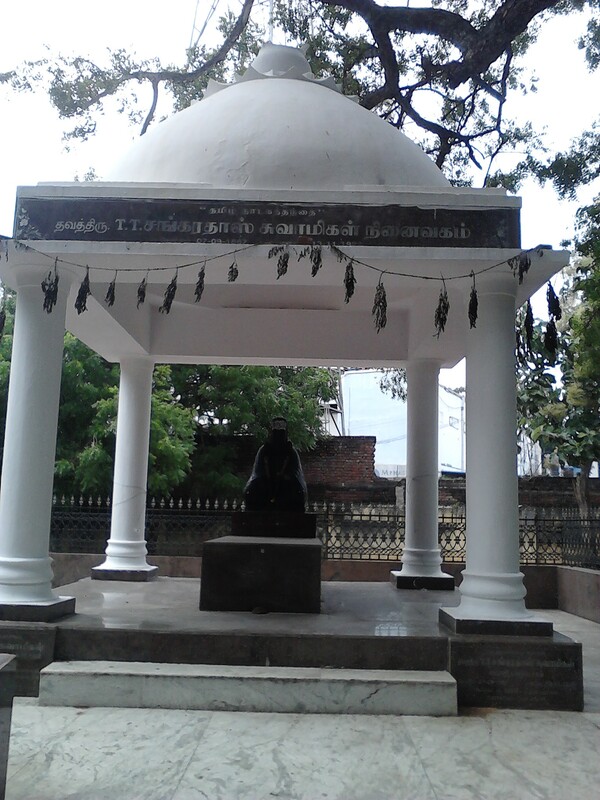 The statue seems to be a later development as a revised edition of “Tamizh Nataka Thalaimai Aasiriyar” brought out much later mentions only a photo being placed at the memorial. Every year on his death anniversary, stage artistes and film personalities gather here to pay homage to his memory. Much to my chagrin, the battery in my camera drained precisely the moment I entered the cemetery and hence I had to make do with some poor quality low resolution pictures of the memorial, which you can see here. It was on my way back that I noticed that not far way from the junction of this road and the ECR is a statue of yet another remarkable personality whose upbringing and association with Tamil theatre is legendary, Chevalier Sivaji Ganesan! !